Home » Uncategorized » New and Improved Document Filters! Now it’s easier than ever to filter your receipts, business cards, bills and other documents with our shiny new document filters! With our new and improved filters you can now select multiple criteria at once, making the process of sorting your organized documents even more effortless than it already was. As always, you can sort receipts by: date range, category, payment type, envelope code, or viewed & unviewed. 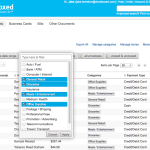 You can also sort business cards, bills and other documents by: date range, envelope code and viewed & unviewed. Power tip: Looking for one document in particular? Try our brand new search tool! If you have any feedback or questions about our document filters please reach us 24/7 at help@team.shoeboxed.com or give us a shout on Twitter @Shoeboxed.